Acoustic Doors – Hazlin of Ludlow Ltd.
Hazlin have been extensively involved in the development of high performance acoustic doors over many years. Working with leading seal manufacturers we have built up a very clear understanding of what a traditional timber core door set is capable of achieving together with developing specialist cores that achieve 46 Rw dBA sound reduction in single & pair configurations. Part E, of the Building Regulations “Resistance to the Passage of Sound” sets out the requirements for control of sound in buildings. HTM 08-01 “Acoustics” sets out the acoustic criteria for the design & management of new healthcare facilities. Building Bulletin 93 “Acoustic Design of Schools – A Design Guide” gives design requirements for schools. This document is now an approved process, making it mandatory for the acoustics requirements to be met. Some basic information is essential if acoustic doors are to achieve the desired results. The healthy human ear can detect sounds covering a frequency range from about 80Hz to 20kHz. However the sensitivity of the ear peaks at around 500Hz to 4000Hz. (4kHz). In building acoustics it is normal practice to concentrate on the range of 100Hz to 3150Hz. Sound is rarely made up of a “pure” frequency. It is normally made up of differing frequencies; differing intensities and can build up & die away. It is normal to measure the “sound pressure level” (SPL) in frequency bands. This is done in either octave band or third octave bands. This outline text -on acoustics is not to provide a full understanding of acoustic calculation of door sets, but to provide some basic information as to what is required and where some of the definitions come from. The equal loudness contour has been constructed by taking a reference sound source with a frequency of 1kHz and a set sound pressure level. A second sound source is introduced at a different frequency until it sounds as equally loud as the first. This is done for each frequency. The level of loudness being measure is the unit called the phon. What is found is that for lower frequencies more sound energy is required to achieve the same loudness. The loudness contour for the 40 phon contour at 100Hz requires a sound pressure level of 52dB, whereas at 1000Hz it requires 40dB. Doors within many commercial buildings are required to perform many functions. For example, access control, office separation, meeting rooms, fire prevention, sound reduction etc. For a door to perform fire prevention its design has traditionally been along a 44mm or 54mm door thickness. To add acoustic criteria to this door, perimeter seals to all edges will provide a certain sound reduction, somewhere in the region of 30 – 34Rw dBa. 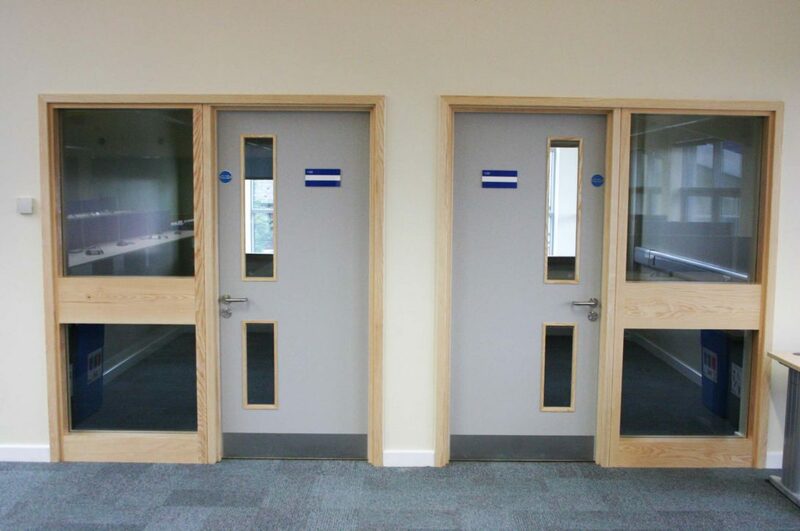 Modifications to this basic door design has improved this performance by 2 or 3 db, for example by increasing the area of glass to 25% of the door area, a door may achieve higher performance. But not every door is going to have 25% of area in glass. Eg a 2040 x 926 door would have a glazed area of 0.47m2 or a 1500 x 310mm vision panel. top end of its capabilities. 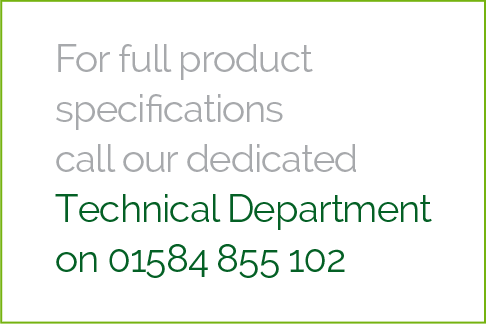 If you have any concerns regarding acoustics in doors, please contact our Technical Department on 01584 855 102. Gaps to back of frame is not sealed in correctly. Threshold seal is not working correctly. Interruption of seals around key ironmongery e.g. :- flush bolts, lock mortises, concealed door closers. Flanking transmission from adjoining walls, soffits and floors. Incorrect adjustment of door closure preventing door from shutting correctly. Gaps in walls & other structural elements allowing sound leakage. Seals have not been fitted to the frame on site. Planted stops have been installed too close to the door leaf preventing the installation of batwing type seals. 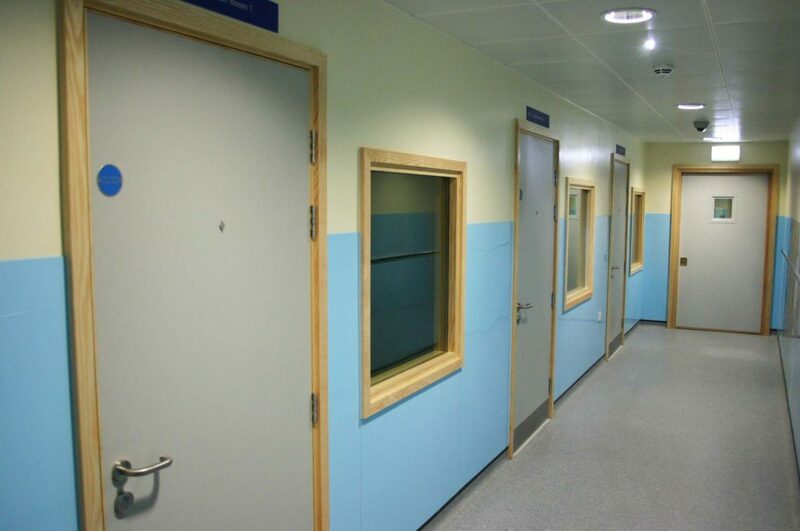 At Hazlin we have extensive experience in the development and installation of acoustic doors. Our doorsets have been designed to allow the door to operate in normal situations where possible. On our high performance doors the use of threshold plates becomes essential, as any sound leakage will seriously detract from the performance of the door set. If you need any more information then please contact our Technical Department on 01584 855 102. 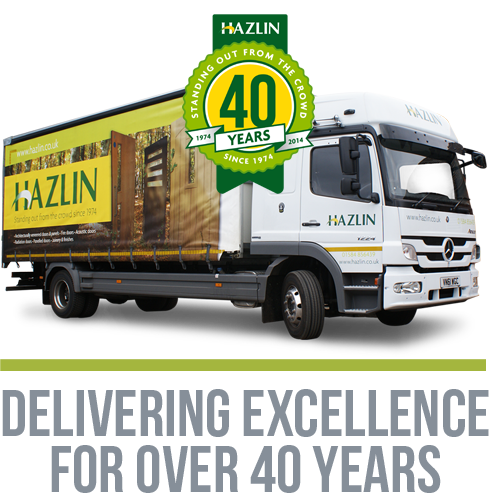 Hazlin acoustic doors are laboratory tested by a UKAS accredited test house, in accordance with BS EN ISO 140-3:1995.